Learning how to jump start a car battery isn’t difficult, but it can definitely be intimidating for first-timers. Here are some of the reasons why your battery might have died and some tips for jumping starting your battery that will help you get back on the road in no time. Why did my battery die? The most common cause of a dead battery is leaving your lights on all night long, but that’s not necessarily the only way to drain your battery. Other culprits can include an interior light that doesn’t shut off due to a faulty door latch or trunk switch, a faulty alternator, or even a poorly installed stereo system, subwoofer, or car alarm that may be leeching power through a short circuit. If you find your battery is constantly dying on you, it’s worth heading to a professional to diagnose the problem. There are two basic tools used to jump start a car battery. The first is standard jumper cables, which are intended to connect your car’s electrical system directly to that of another vehicle nearby, allowing you to use its juice to get your engine going. You’ll need to choose the right length of cable; standard units force you to park face-to-face. That’s not always possible on a busy highway, where it may be safer to park nose-to-tail and use a set of extended cables. Thicker cables, noted by their lower gauge size, will also transmit electricity more efficiently, which makes for easier jump-starting. Finally, solid copper clamps always beat copper-plated clamps as the latter design (Sugg. : because the plating) can wear off over time and significantly reduce your ability to jump start a car battery. Another option is a portable power pack, which is a self-contained battery you can keep charged in your trunk or garage. The pack can be attached to your car’s battery and save you from having to wait for a rescue. 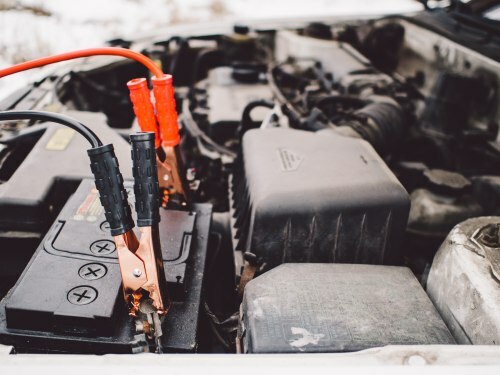 Regardless of whether you use cables or a power pack, learning how to jump start a car battery requires you to understand how to make the right connection with your vehicle’s electrical system. Always connect the positive terminals first. Then connect the negative terminals, starting by the working battery. Although you are likely familiar with the concept of connecting the positive terminals and negative terminals together using jumper cables, it’s a good idea to clamp to the chassis of the car being jumped started instead of the dead battery’s negative pole. This provides you with a stronger ground—the battery itself has to ground out through the chassis, so you are cutting out the middleman—and ensures that any sparks that might fly are located far away from the battery, which could be venting flammable gases. If you are using a battery pack, you’ll follow the same steps: positive cable to positive terminal, negative cable to negative terminal or ground pole/chassis. Lastly, make sure that the pack is on and ready when you crank the ignition on your vehicle. For more information on how to jump start a car battery, chat with a knowledgeable expert at your local NAPA AUTOPRO service centre. Since 1984, NAPA AUTOPRO has been the place Canadian drivers turn to for mechanical repair and vehicle maintenance services.